Commercial systems built today are increasingly using XML technologies for storing any amount of text or data. 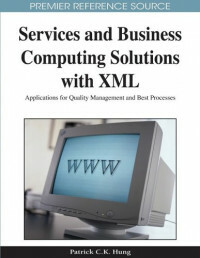 Services and Business Computing Solutions with XML: Applications for Quality Management and Best Processes collects the latest research for academicians and practitioners that describes the use and synergy between data structure technologies. This book explores and investigates various issues of XML data and related applications summarized by Web services. Patrick Hung is Associate Professor and IT Director at the Faculty of Business and Information Technology in UOIT and Adjunct Faculty Member at the Department of Electrical and Computer Engineering in University of Waterloo. Patrick is currently collaborating with Boeing Phantom Works (Seattle, USA) and Bell Canada on security- and privacy-related research projects, and he has filed two US patent applications on "Mobile Network Dynamic Workflow Exception Handling System." Patrick is also cooperating on Web services composition research projects with Southeast University in China. Recently he is working on a mobile healthcare project with the Hong Kong Red Cross with the Chinese University of Hong Kong. He is an executive committee member of the IEEE Computer Society's Technical Steering Committee for Services Computing, a steering member of EDOC "Enterprise Computing," and an associate editor/editorial board member/guest editor in several international journals such as the IEEE Transactions on Services Computing (TSC), International Journal of Web Services Research (JWSR) and International journal of Business Process and Integration Management (IJBPIM). He has been published more than 100 research and technical articles in international journals, conferences and workshops. The physical linkages responsible for carrying a company's data continue to be the most neglected components of the typical network—to the extent that nearly 700f all network-related problems result from poor cabling.